Portfolio manager and analyst Stephanie Henderson is part of Putnam’s sustainable investing team that manages Putnam Sustainable Leaders Fund and Putnam Sustainable Future Fund. A truly unique and exciting opportunity! Putnam approached me about launching a new sustainable investing team and working with Katherine Collins. I was very happy in my role at the time, but felt like this was my dream job being handed to me. ESG investing aligns with my skill sets, my interests, and the values I champion. I was really impressed by Putnam’s drive to enter this area and thrilled about the prospect of working with Katherine — a true thought leader in this space. 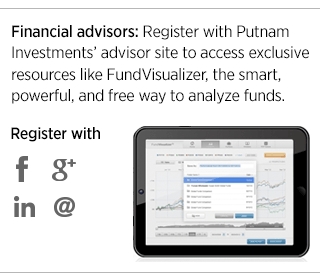 All of our sustainable investing efforts build on Putnam’s core strength: deep, fundamental research. For the broader organization, focusing on relevant sustainability issues and building ESG fluency throughout the firm enhances our fundamental insight. It’s about asking deeper questions and having more tools to analyze businesses, which should lead to opportunities for alpha creation and risk mitigation. In addition to the investment benefits, there’s a real market opportunity here. More institutional investors are asking for products that address these issues. Sustainable investing and assets under ESG mandates are among the fastest growing parts of the business. We think we are in a sweet spot: We have the tools to do this well at the firm, we believe this is a core component of good investing, and the evidence increasingly shows that strong financial performance and strong sustainability performance can go hand in hand. In the Equities division, we’ve converted roughly $5 billion to sustainability-focused mandates with the Putnam Sustainable Leaders and Putnam Sustainable Future funds. These are fairly concentrated portfolios, and the bar for any company to get into these funds is high: We are looking for companies with excellent fundamentals, great sustainability characteristics, and reasonable valuation. In Putnam Sustainable Leaders Fund, we are looking for companies that show a dedicated commitment to sustainable practices, or how they operate their business. In Putnam Sustainable Future Fund, we are looking for solutions-oriented companies that are addressing global sustainability challenges through the product or service that they provide. Understanding the company-specific context for our investments — both for traditional fundamentals and for sustainability issues — is key to our investment process. * Alpha is a measure of performance on a risk-adjusted basis. Alpha takes the volatility of a mutual fund and compares its risk-adjusted performance to a benchmark index. The excess return of the fund relative to the return of the benchmark index is a fund’s alpha. Consider these risks for these funds before investing: The value of investments in the fund’s portfolio may fall or fail to rise over extended periods of time for a variety of reasons, including general economic, political, or financial market conditions, changing investment sentiment and market conditions, government actions, geopolitical events, or changes, and factors related to a specific issuer, industry, or sector. These and other factors may lead to increased volatility and reduced liquidity in the fund’s portfolio holdings. Growth stocks may be more susceptible to earnings disap­pointments, technological obsolescence, falling prices and profits, and the market may not favor growth-style investing. Investments in small and/or midsize companies increase the risk of greater price fluctuations. International investing involves currency, economic, and political risks. Emerging-market securities carry illiquidity and volatility risks. The fund’s sustainable investment strategy limits the types and number of investment opportunities available to the fund and, as a result, the fund may underperform other funds that do not have a sustainable focus. The fund’s environmental, social, and/or corporate governance (ESG) investment strategy may result in the fund investing in securities or industry sectors that underperform the market as a whole or underperform other funds screened for ESG standards. In evaluating an investment opportunity, we may make investment decisions based on information and data that is incomplete or inaccurate. In addition, an Impact Company’s products or services may change over time. As a result of these possibilities, the fund may temporarily hold securities that are inconsistent with the fund’s sustainable investment criteria. You can lose money by investing in the fund.